Choosing correct CNC router hold down methods is one of the most important factors which affects the quality and efficiency of any CNC router application. Computer numerically controlled (CNC) applications provide consistent and reliable operations, which is a vital component in quality processes. Supporting CNC router applications with equally consistent and reliable hold down methods will determine the quality, efficiency, and profitability of any CNC router process. CNC router hold down methods must hold the substrate, parts or work piece firmly and securely in place during cutting processes. CNC router processes may be used in cutting applications of wood, plastic, plexiglass, aluminum, composites, steel and other various materials. It is important to develop a project plan which includes many considerations to ensure the most effective and cost efficient cutting process. 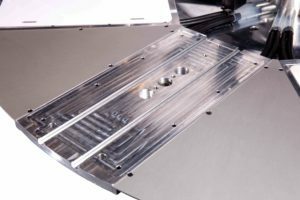 These are all important considerations when evaluating the hold down force required of CNC cutting processes. Some CNC processes may use screws, clamps, jigs, adhesives or vacuum chucks to hold down material during router applications. Of all these options, vacuum force provides many benefits to most CNC router processes in all considerations for required hold down force. Screws – Using screws to secure the workpiece directly on the table for cutting can work well with some materials. This may prove inefficient for changeovers, depending on the number of screws. Care must be taken to ensure that all screws are out of the line of cut path. Clamps – Using clamps to hold your substrate in place may offer strong holding power without the hassle of screws. They may not, however, provide enough hold down force for some CNC router applications which require maximum cutting force through hardened materials. Press-Fit Jigs – Jigs can be made quickly and may be a good solution for holding smaller pieces if there is no room for screws or even clamps. A tight fit is required for precision cutting processes. Adhesives – Adhesives may be beneficial in some applications but can be very difficult to work with. When evaluating the use of adhesives be sure to factor the need for a clean and dust free environment. Vacuum – Using a CNC router vacuum can provide many benefits over other hold down methods. A quality built vacuum table offers many advantages enhancing the CNC router process with consistency and reliability. CNC router vacuum chucks provide many advantages over other methods which increase the quality, efficiency and profitability of CNC router applications. A quality built vacuum system addresses all concerns with CNC cutting processes, while providing many benefits including convenience and versatility. Systematic Automation is a leading vacuum chuck manufacturer, offering superior CNC router hold down methods that meet customer specifications. We have over 35 years of experience in manufacturing vacuum tables with precision flatness of +/- .001” per linear foot, in a variety of sizes from small to large applications. Our vacuum tables come in standard sizes of 5” x 6” up to 48” x 48” with 1 3/16” thickness, and 48” x 96” up to 72” x 144” with 1.5” thickness, with custom sizes available upon request. Systematic Automation these custom engineering features with two vacuum pump styles to meet your vacuum requirements. We address all concerns with sacrificial sub plates available for thin materials, table top requirements that meet your specifications, parts will not move or fly around when cutting which enhances quality and safety, and changeovers are quick and convenient, improving throughput and cost efficiency. Systematic Automation is a leading global supplier of vacuum tables, screen printing machines, and flame treatment machines all manufactured in our modern facility in the U.S. All equipment is tested rigorously prior to shipping with continual customer support to ensure a successful process. Contact us today to learn more about our automated equipment including our vacuum tables for the most beneficial CNC router hold down method.